Lecouflet M, Leux C, Fenot M, Célerier P, Maillard H. Duration of efficacy increases with the repetition of botulinum toxin A injections in primary palmar hyperhidrosis: A study of 28 patients. J Am Acad Dermatol. 2014 Jun;70(6):1083-7. Krogstad AL(1), Skymne A, Pegenius G, Elam M, Wallin BG. 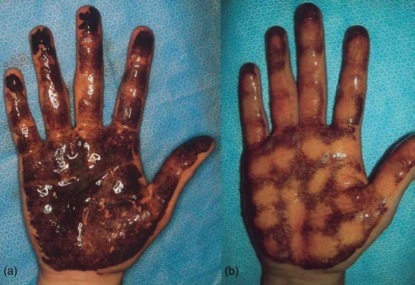 No compensatory sweating after botulinum toxin treatment of palmar hyperhidrosis. Br J Dermatol. 2005 Feb;152(2):329-33. Yamashita N(1), Shimizu H, Kawada M, Yanagishita T, Watanabe D, Tamada Y,Matsumoto Y. Local injection of botulinum toxin A for palmar hyperhidrosis: usefulness and efficacy in relation to severity. J Dermatol. 2008 Jun;35(6):325-9.